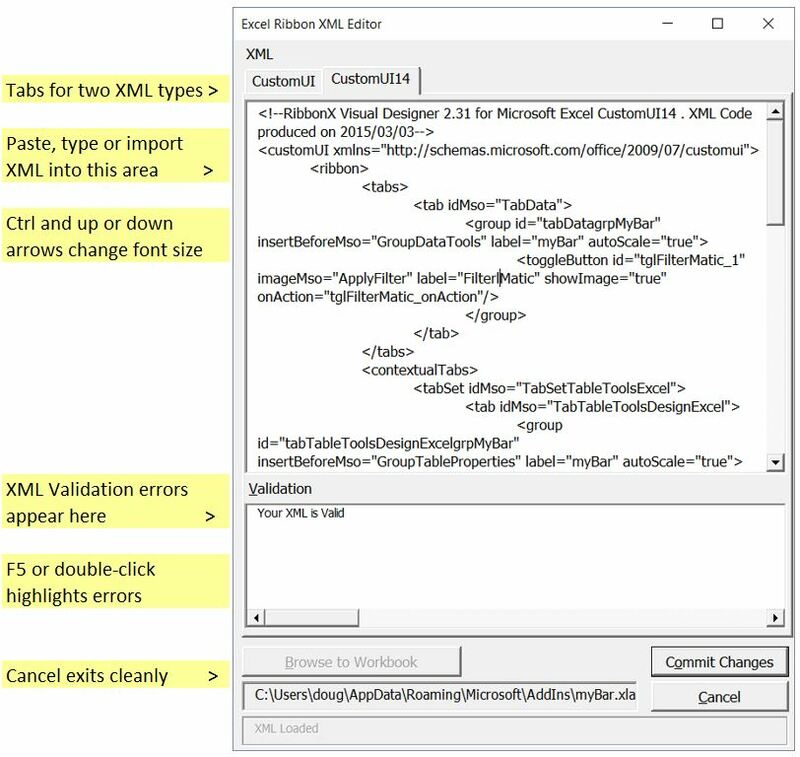 Over at my site, yoursumbuddy, I’ve published an Excel addin for creating, editing and validating the XML that makes up Excel Ribbons. I developed it because I can’t install executables at work and want an addin that I can just run from Excel. 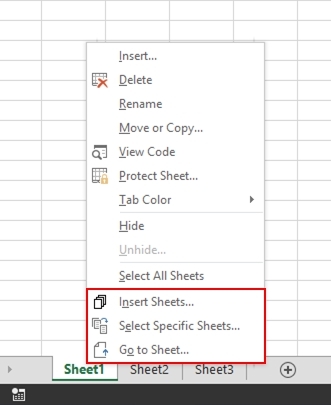 It works on ribbons in workbooks and addins and runs in Excel 2010 and later. Along the way I learned about XPATH, SAX, and DOM as they relate to XML and VBA. 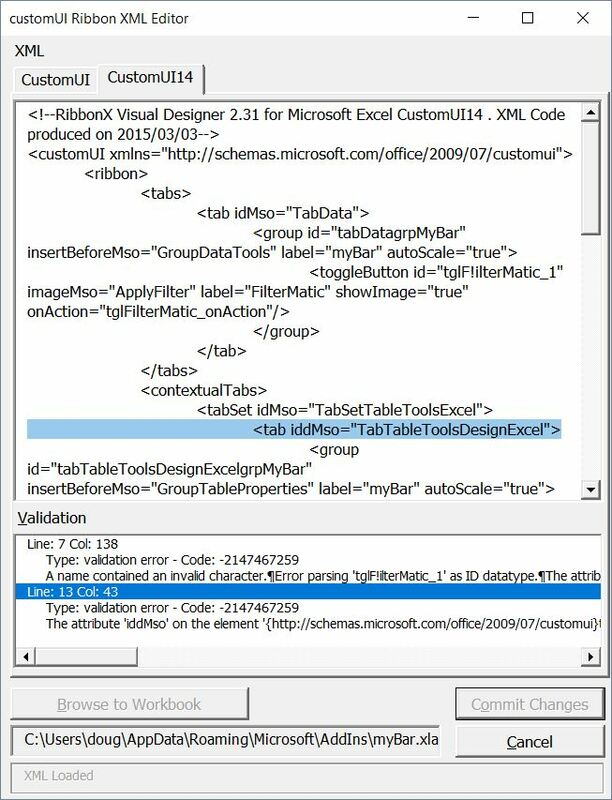 I’ve already forgotten what those things are and how they work, but they were important for a tool that downloads customUI/customUI14 XML, validates multiple errors, creates and/or modifies the .rel entries, and then uploads it all back into the zip file that is an Excel workbook. Whew. Should you care to learn more, my unpassword-protected code is available for your reading pleasure. If you poke around you’ll see that my code is built on the work of Jan Karel Pieterse, Ken Puls, Ron deBruin and even keepitcool. Thanks to all of them! To learn more and download the addin, just visit the yoursumbuddy Ribbon customUI XML Editor page. Based on an idea by fellow Excel MVP Frédéric le Guen I have created a new small Excel add-in which makes your life using tables in Excel slightly easier. 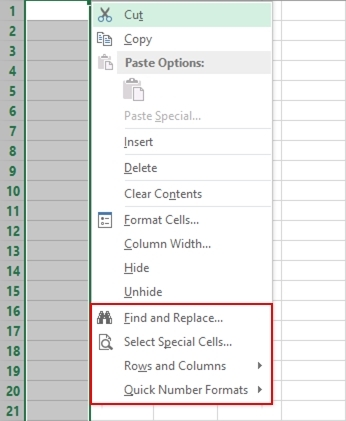 It sports a ribbon tab which contains a drop-down containing all tables in your worksheet so you can quickly jump to them and another one which displays all columns in the current table. Both items are also available in the cell right-click menu. 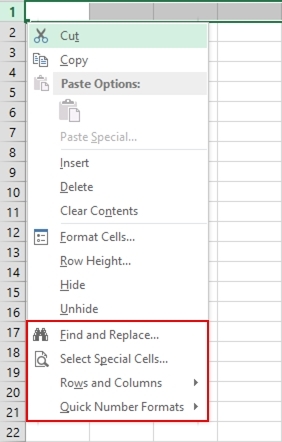 The former when you right-click on a cell not in a table, the latter when you click on a cell within a table. Regards and have a great summer! Well, turns out I’ve been quite busy as of late. So I decided it was time to dust off some old stuff I prepared to add to my site but never came round to finishing (I must have become less busy when I was almost done :-) ). 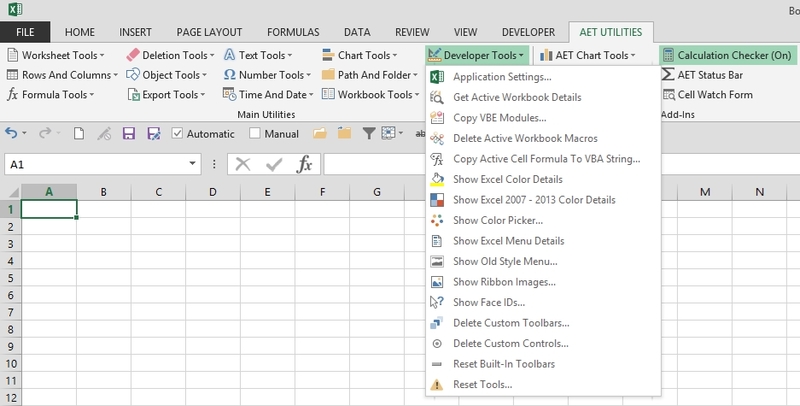 If you’re about to embark on the journey to create an add-in out of a set of macro’s you have been using for some time now, this article is a nice read as it takes you through most of the steps needed when building an add-in for Excel. Hi there. For the last few months I’ve been working on my main add-in, AET Excel Utilities. So far I’m in the process of setting up some partners, had a translation offer, and downloads are happening as I write this. Thanks very much to everybody for your help. Don’t be shy if you are interested! I first started working on it in 2005, as a hobby, and a way to learn VBA. Over time it’s grown from having a handful of very simple tools, to what it is now – well over a hundred utilities (more like over two hundred), and some of them quite complex, even if I do say so myself. Useful? I like to think so. Not a day goes by that I don’t use it, and I can honestly say it saves me lots of time. But there’s a problem. Even though I like these utilities, I’m not very good at selling myself, letting alone anything I’ve made. And in the world of Excel, most folk have either never heard of me or think I’ve retired if they have. That’s been fine until now, with me plugging away in a corner, tinkering away, but it’s always bothered me that my tools could be so much more. So, I’d ask all of you for some help. I’m making the tools shareware. And I’m looking for people to help sell them. Do you have a site? If so, are you willing to become a partner or an affiliate? Like I say, I’m not great at sales so any assistance would be appreciated. Translations? Great! Let’s talk about a percentage. I guess the main thing is making people aware of them. Apart from making a bit of pocket money, serious interest will give me incentive to improve them and maybe even try to give my site a bit of an overhaul. (Please contact me using aengwirda [at] gmail.com if you are interested). Here’s a few screenshots to whet your interest. (Well maybe more than a few…). Look to the left, the AET UTILITIES tab shares both my main utilities and free add-ins (which you can download here). Here’s the download page link. On the same webpage, you can also download a copy of the Help files for more details on the individual tools, plus the password to see how the code works. In addition to adding more tools over the next few weeks, I’ll be working on my free utilities too. More details on them, and also some new code samples, that I’m looking forward to posting about in the near future. Our event is coming real soon now and we’re very much looking forward to it. We have outstanding speakers and excellent content, so everything is lined up to make this a superb Excel event. To entice the undecisive Excel lovers to make up their minds and subscribe after all, we decided to make it even more attractive to attend. As of March 27st, 2015 we offer a € 200 last-minute discount per attendee for both days and € 100 for one day! Register now at http://topexcelclass.com/index.php/amsterdam-excel-summit/registration/ and meet us on April 13th and 14th in Amsterdam. Every quarter Microsoft announces who are the lucky ones to receive their Most Valuable Professional Award. An MVP award lasts a year, so for a quarter of the MVPs, October 1st is an important day. Head over to my website and download the tool, you can try it for free!